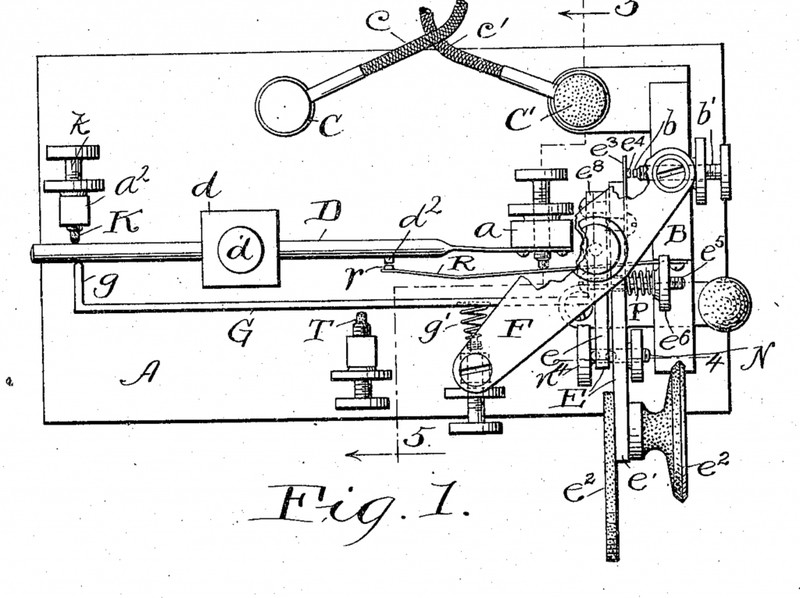 Homebrewing history — reproducing automatic telegraph keys from patent drawings. I have always been interested in CW especially when as a boy the best I could afford was a Heathkit DX-20, a CW-only transmitter and a military six metal-tube Command Set 40 meter receiver. With this rig I was forced to use CW exclusively and I learned to love telegraphy and became fairly good at it. In those days all I had was a J-38 straight key and I pined after a Vibroplex bug (bug is another name for semiautomatic keys). The best CW men always had a gleaming bug whenever you saw them pictured in QST or CQ. In later years, I found I could hardly pass up a bug for sale at a hamfest. Presently, I have developed an interest in early bugs and machining. If you’re interested in key collecting, there are quite a few Web pages devoted to such collections. Finding old bugs seems like a lifetime pursuit of searching hamfests and buying or trading with other collectors. Rather than collecting them, I decided to re-create the keys I wanted, myself. This route to acquiring old key designs can be just as expensive as buying the actual keys but has the advantage of timeliness and pride of craftsmanship. How good were the original bugs? I became interested in comparing the first all-mechanical bugs. Telegraph keys are ideal subjects for manufacture by machining. Looking at pictures of old bugs, I could visualize how I might go about making duplicates using my machines. There are parts that the original manufacturer might have created by casting, but in most cases as I gained experience I could see how I might go about using my machines to do the same job. In the early 1900s casting some of the parts would have been faster and cheaper as far as mass production is concerned but I was interested in single versions of selected old bugs. In fact, I decided that I was not even interested in exact copies that would fool a collector. . My goal was to create workable copies true to the original so that I could see how they worked for myself. I have seen this very idea expressed on historical TV shows. In these programs, builders might re-create ancient weapons of the Romans to see how they worked. They used whatever evidence they had to re-create versions that they believed worked as well as the originals but were not exact copies. More apropos are those who re-create machines designed by Leonardo da Vinci. Here again, they are not exact copies but only designed to work as the inventor envisioned. In this case, they had detailed drawings to guide them. Yes, the early bugs were patented and the patents contained detailed drawings. The patent law states clearly that in order for a patent to be valid, someone of ordinary skill in the art to which the patent pertains must be able to reproduce a working example from the description in the patent. This requirement is to prevent withholding key information so that when the patent expired no one would be able to reproduce the device. After a specific time period (17 years at the time the first bugs were developed; today the period is 20 years.) the patent expires and it belongs to the public. Therefore, the early bug patents had workable drawings that a good machinist could reproduce and see for himself the essence of the patent. Presently there are over 7 million US patents, literally the greatest concentration of practical knowledge ever amassed in human history. My story is about early bugs but it could have been about patents using the history of the bug as proof of the wisdom of the patent laws and their authors, the founders of our great nation. When Franklin and Jefferson thought up the patent system, the guild system was prevalent. It was a system of secrets and such secrets were passed from father to son or apprentice. There was no way for advancement as nothing was published for others to see. Our patents are published for all to see. Every patent is available online and so I decided that I would look at all of the bug patents, first to last. Telegraphy was decades old when the first bug appeared. It was invented by Horace Greeley Martin and was called the Autoplex. It employed the same circuit as a bell or buzzer. An electromagnet pulled in a spring-loaded clapper. The clapper pulling in would interrupted the circuit, permitting a spring to return the clapper to its original position, re-establishing the circuit and the cycle would repeat. Instead of ringing a bell the clapper made a sequence of dots repeating as long as the circuit was connected. 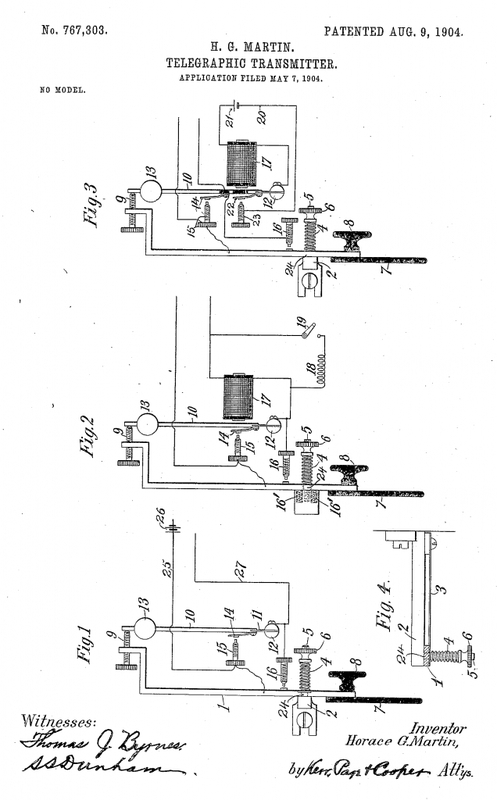 Two patents were issued to Martin (see Figures 1 and 2). Many professional telegraphers who at that time had worked for years pounding brass had developed glass arms (carpal tunnel syndrome) and were desperate for a key that relieved the stress of making dots. The Autoplex did this job for them but they still had to make the dashes, which was less laborious. Telegraphers worked long hours sending and receiving tens of thousands of words without unemployment insurance, health benefits or social security. One needed his job even if his arm hurt. I’m sure such workers would have wanted the Autoplex if they could have managed its overall cost of ownership. The average salary was $10 per week in 1903 and at $25, it cost about 2 weeks salary .The employers did not provide the keys or batteries to run them. Martin’s Autoplex was a commercial success, but although it worked quite well and was valued by telegraphers, it required batteries. This was no small problem in 1903 when batteries were expensive, heavy and cumbersome. 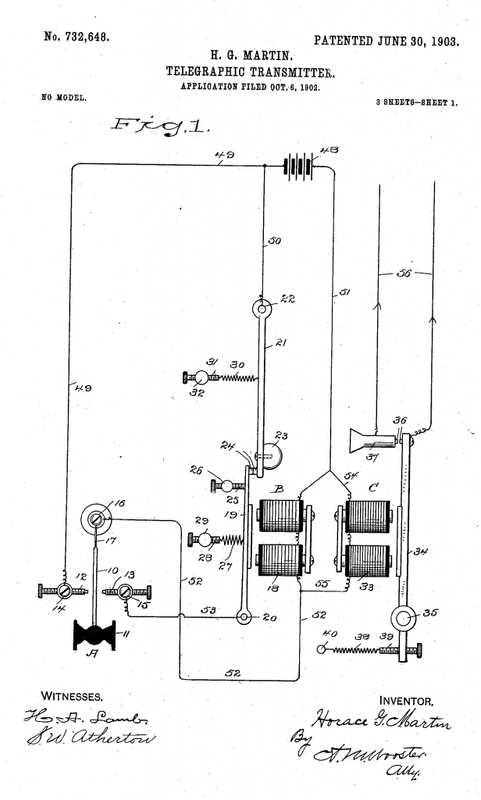 The Autoplex patents were published and it became apparent to those interested in commercial keys that if one could be developed that was totally mechanical and reasonably priced, telegraphers would rush to buy it. Martin developed such a key but was beaten to the punch by W. O. Coffe who worked for a competitor, the Mecograph Company. Coffe’s patent was issued first (see Figures 3A and 3B). As can be seen in the drawings, an actual pendulum was used to make the dots. Pushing the key arm to the side releases the pendulum, allowing it to strike the contact repeatedly. Releasing the arm allows the spring to hold the pendulum back in the neutral position (see Figure 4). A very clever idea that must have caused Martin’s hair to stand on end. 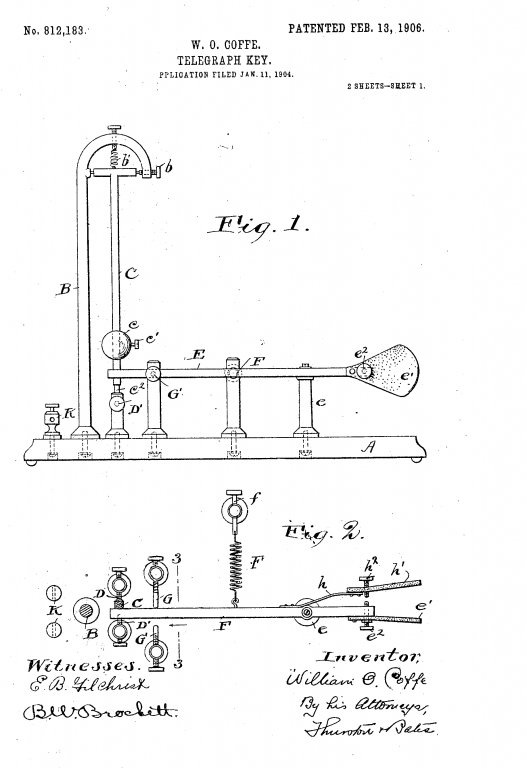 Martin was not to be deterred and his next patent was the familiar and beloved Vibroplex. Coffe could have sparked Martin’s idea, but some say Martin had his idea before Coffe’s patent was issued. I like to think this is a classic example of what the founding fathers had in mind. One idea would lead to a better idea and our nation would prosper. Little did they dream of the magnitude and success of their patent system. 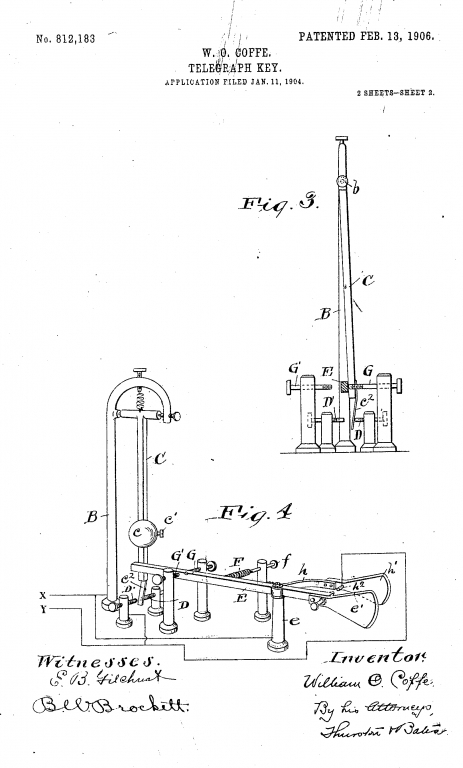 Martin as we know placed the pendulum within the key lever, simplifying the apparatus and thus reducing its cost to about 1 week’s salary (see Figures 5). 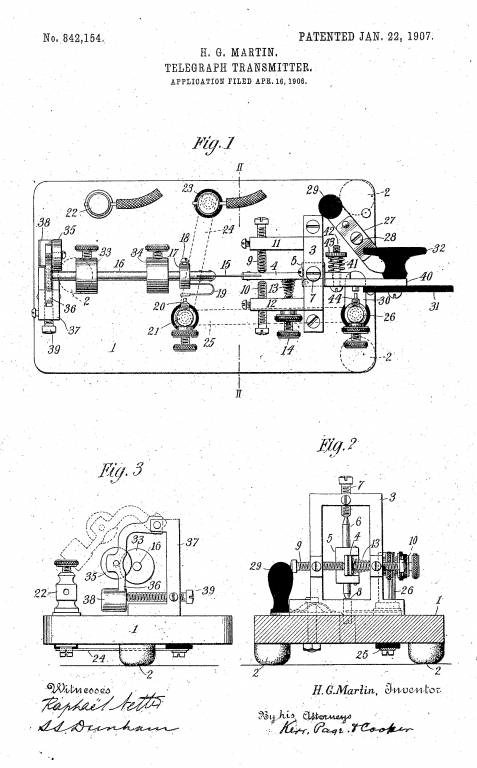 Mecograph was owned by Bellows who upon seeing the success of the Vibroplex, built on Martin’s idea but employed the release mechanism of Coffe’s patent and received a patent on a new bug (see Figure 6). Albright, who owned Vibroplex, and Bellows entered into a patent infringement lawsuit that didn’t prevent either from continuing to manufacture or market their bugs. So now, Vibroplex and Mecograph duked it out in the marketplace. Vibroplex proved the more successful marketer and won this contest. Bellows died suddenly and Albright, apparently a very smart businessman, bought Mecograph from Bellows’ widow. Vibroplex absorbed Mecograph and the Mecograph keys went extinct. Albright defended his patents against all comers but eventually he licensed others and collected fees. I believe he knew the Vibroplex was the best and as we used to say a “Cadillac” of bugs that would out-sell all others. When the patents expired, many other bug manufacturers came on the scene, but that’s another story. Were the Mecograph bugs any good? Did Albright buy the company because they were effective bugs or just to clear the marketplace of an annoying competitor, or for both reasons? Did he pay a good price for the firm and its patents or did he get it so cheap that it was a no brainer to acquire it? There is only one way to answer some of these questions. Since I did not own any Mecograph bugs and they are rare as hound’s teeth, I decided to make my own versions. I used the original patents as guides and tried my best to be faithful to the mechanism even if my esthetics were not exact. I think I did a very reasonable job as you can judge from Figures 7 and 8. Coffe was the first man to receive a patent for a mechanical bug and I’m certain his bug worked better than mine because I probably made some minor construction mistakes. I’m also concerned that the weight on the pendulum is very critical and my adjustments may be off, but I believe that the Bellows’ patent using Coffe’s release mechanism with Martin’s internal pendulum (spring) worked as well as Martin’s Vibroplex. My version is fun to use and in my opinion even today would be a competitor to the Vibroplex. Without Coffe’s patent Bellows could not have gotten around the Martin patent. In use, the Vibroplex type is easier to adjust and makes heavier dots — key advantages. I believe that Vibroplex bought out Mecograph when they had the chance because they were serious competitors. Now Vibroplex had all of the “key” patents and a clear field to dominate the market for semiautomatic keys for years to come. With a clear path before him, Martin went on to invent improved versions of the Vibroplex that delight aficionados even to this day. See Figures 9 and 10 for my versions of Martin’s Vibroplex and Wirechief bugs. All photos by Bob Login, AA8A, except as noted. Bob Login, AA8A, an ARRL member, was first licensed in 1956 as KN2VQM and received his present call after upgrading to Extra in 1977. He enjoys homebrewing and restoring vintage ham gear. He has written articles concerning his projects for QST and Electric Radio magazines. Bob is a retired organic chemist and holds 156 US patents granted over his career. You can contact him at 1416 Tanager Trail, St Marys, GA 31558.